Born in Montreal, Renaud grew up in Saint-Lambert, Quebec in a musical family. He first began playing the violin at age five, and spent nearly ten years studying music at the Conservatoire de musique de Montréal with Raymond Dessaints. He went on to receive his Bachelor’s and Master’s degrees in Performance under Anne Robert at l’Université de Montréal. Renaud has performed and toured with Orchestre symphonique de Montréal throughout Canada, Japan, Korea, and Europe, where he visited twelve cities in two weeks. He has also toured in the U.S. with Les Violons du Roy, playing in Los Angeles at the Walt Disney Centre and in New York at Carnegie Hall. In 2005, Renaud was winner of the Trois-Rivières Symphonic Orchestra Competition. Previous appointments as Concertmaster include the Orchestre de la Francophonie canadienne and Orchestre de l’Université de Montréal. 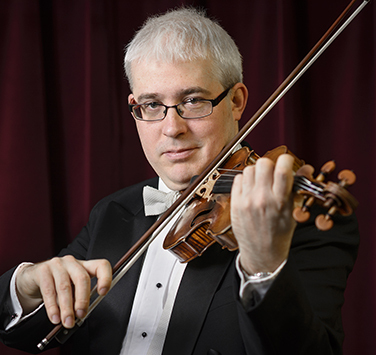 He also held the position of Principal Second Violin for Symphony Nova Scotia in 2011/12. In his spare time, Renaud enjoys reading, cooking, hiking, camping, getting together with friends, and spending time with his two children. Renaud plays on a Vuillaume from 1855, graciously provided by Canimex Inc. from Drummondville, Québec. Both of my parents were in love with music, and they actually learned how to play; my dad played the lute, and my mom played the viola da gamba. I would say everything written by Mahler (especially his fifth symphony). What’s your favourite music group(s)? The Beatles (I know, I am retro), the Beastie Boys, and Radiohead. Quel est la meilleure / pire chose à propos d’être membre de Symphony Nova Scotia? C’est un superbe orchestre symphonique de chambre… Je veux dire que parfois c’est un ensemble trop petit pour certaines œuvres du répertoire symphonique, mais parfait pour la vitesse et l’efficacité de la communication entre les musiciens. Si vous ne pouviez pas être un musicien, que voudriez-vous faire?